The weird, unfortunate distance between data centers and office buildings is finally being bridged. Data center specialist SynapSense has rolled up another $5 million in funding, but perhaps more importantly, it will get to go on sales calls with General Electric in the future. GE joined existing investors in the latest round, which brings the total invested in SynapSense to $25 million. Other investors include Bosch, American River Ventures, Nth Power and DFJ Frontier. "We are tremendously capital efficient for a green technology company," joked CEO Pete Van Deventer. The two companies, though, will also combine forces to sell their products. Two years ago, SynapSense sold a system that took a snapshot of the temperature, pressure, humidity and other environmental factors affecting the weather in the micro-climate of data centers. It then provided recommendations to corporate customers on how to adjust their air conditioners to data center's AC unit based on the information from the sensors and software. In an early test, the system found ways to reduce power consumption in a Yahoo data center by 21 percent. "Now we are controlling the weather," Van Deventer said. "It's a natural evolution from monitoring to taking action based on the data." Potentially, the company could even start to control servers and storage systems, rotating applications from different rows of computing equipment to save power by reducing hot spots the AC system needs to cool. Another startup, Power Assure, makes a product like that now and has been landing a number of large clients. 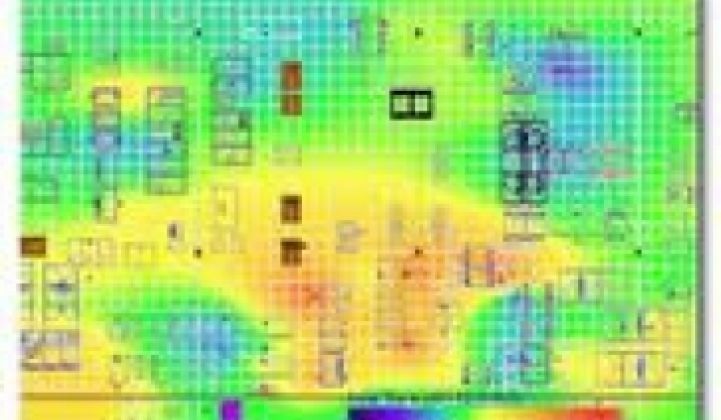 (The picture shows a thermal map of a computer room.) Other companies to follow include Sentilla and Arch Rock. Data centers account for only around 1.5 percent to 2 percent of the power consumed in the U.S. The figure, however, is increasing. Another important factor: the benefits can be somewhat easily measured and implemented. Thus, it can be a lot easier to sell these sort of services than trying to convince someone to erect wind towers. Sometimes only one-third of the power consumed by data centers gets consumed by computers: the rest gets gobbled up by air conditioners and lights. GE's global infrastructure unit, meanwhile, sells systems that control the chillers for AC systems and AC control systems for campuses and facilities. By working together, GE and SynapSense can provide corporate customers with a more global, organic view of their power consumption. Right now, in many corporations, data center and the power they consume exist on an independent island. GE also has a pretty handy Rolodex that can help SynapSense get in the door, particularly overseas. The Bosch investment will help in that regard, too. Van Deventer also asserted that SynapSense has been steadily gaining customers. Facebook, Yahoo, NBC, GE, Stanford and a number of large banks are already customers. Many have graduated from using the system in a trial to deploying it widely, he added. One customer who remained unnamed was able to cut data center power consumption by 10 percent. Another customer was able to garner a $750,000 rebate for retrofitting its data center and managed to cut operating expenses by another $750,000 per year. Hewlett-Packard resells SynapSense's technology as its Environmental Edge service for data center management. Because acquisitions are likely inevitable in this space, the relationship between the two makes HP at least an early potential buyer. Currently, only around one percent of data centers actually manage their power in this way, but that figure could rise to 60 percent by 2014, Van Deventer said, citing Gartner.